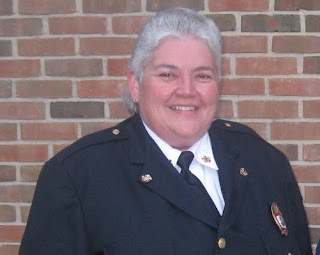 On Tuesday, September 22, 2009, the City of Carlisle officially appointed Krista R.Wyatt as its interim Fire Chief. Chief Wyatt began her official duties on Wednesday, September 23. The Fire Chief position became vacant upon the resignation of longtime Chief Greg Wallace on July 28, 2009. Chief Wyatt will serve as interim Fire Chief while City Council fully explores options for provision of fire service to City residents. Several years ago City Council appointed an ad hoc committee whose purpose was to investigate options and make recommendations to Council with regards to the City’s fire service. This committee thought it would be beneficial to have a citizen survey with regards to fire service. In September, 2008, City Council directed that a survey be developed to gain input regarding various city services with several questions directly related to provision of fire service. Subsequently, the City partnered with the Master of Public Administration Program at the University of Dayton to create a citizen survey and evaluate the results. The University provided this service at no cost to the City. Sixty-five percent (65%) of those responding preferred that the city continue maintaining its own volunteer fire department. Fifty-nine percent (59%) supported investigating the possibility of forming a joint fire district with neighboring communities. There was no significant support for creating a paid fulltime department or contracting with another governmental entity for provision of fire service. At their meeting of August 4, the Ad Hoc Committee reviewed the survey results and recommended to City Council that the City pursue a joint fire district. City Council accepted the Committee’s recommendation to pursue discussions with various neighboring communities on the formation of a joint fire district while maintaining its present volunteer force in the interim. Chief Wyatt will serve as interim Fire Chief while the recommendations of the Ad Hoc Committee are explored. Chief Wyatt has over 20 years of experience as a firefighter/paramedic, 16 of which have been in a supervisory capacity. She is the first career Captain with the City of Lebanon Fire Department and has served in that position for over 10 years. She also served as a Lieutenant and Captain in the Lebanon Volunteer Fire Department. She brings significant experience to the City of Carlisle in the operation of a volunteer fire department. She has a Bachelor of Science Degree from Miami University, an Associate Degree in Fire and EMS Administration from Sinclair Community College and is a graduate of the Ohio Fire Executive Program. She is a Level 2 Fire Fighter, Paramedic, Fire Safety Inspector, Fire Fighter Instructor and EMT Instructor. The City of Carlisle is fortunate to have someone with her experience and expertise serve on an interim basis to enable City Council and staff adequate opportunity to fully explore the options available to provide the best fire service to our residents and community. Come on Carlisle Daily give us all the news. Is there a prior relationship between our Carlisle City Mgr. and this newly appointed Chief that influenced the decision to hire this person so Quickly. Old pals? old co-workers, etc. Why not just hire someone from Cleveland because they would be just effective as this arrangement. Where's the Council ???? No input at all ??????? Congrats to Mayor Tim Humphries, Carlisle City Council and the City Manager for hiring a person that is committed FULL TIME to Lebanon and only PART TIME to Carlisle. Just what we need in Carlisle. DO NOT BELIEVE this because the Mayor and City Council hired the City Manager, Sherry Callahan. Take responsibilty for this Humphries and City Council. Right, where is the explanation from Council and Mayor Humphries? I know Tim Humphries and the City Council members look at these articles on a daily basis. Mayor Humphries and City Council - It's time for you all to step up and explain how you let this happen to the City of Carlisle. You must have thought this was the best move for Carlisle since I'm sure you all approved the hiring of Chief Wyatt. We are waiting to hear from you Tim and Council. What if somebody arranged for a town meeting of some sort in order to address the public in this matter? I see that the posters are anonymous, and quite frankly, I'd like to know for sure that this isn't some personal ax-grinding. I would like to ask Council for an explanation and open-mindedly listen to the answers. I may very well agree with the decision that was made, but I sure would have liked to have been included in the discussion. And, for the record, remember it's just a press release...The Daily didn't compose the article. They just ran it as it was prepared by the City. If Ms. Wyatt is all she is cracked up to be, and I have no reason to believe she won't be, then it sounds like it would have been an easy sale before-hand. I'm just curious why the decision to hire a new fire chief wasn't made more public BEFORE the actual hiring. Is this power and authority run amok? Is it one individual acting beyond her scope of authority? If so, why won't council address that misconduct? Is it all just a smoke-screen where Council was in favor of it all along but didn't want the public to know? I don't have any answers to any of these questions...But I'd sure like some. I say we try to organize a meeting to discuss it. We can certainly attend the Council meetings, but that's a very citizen-unfriendly environment. What I mean to say is that when you attend a council meeting, you feel as if you are in someone else's home and you have to follow certain protocol etc. It can be very unnerving for the average citizen. I say we find an neutral and non-combative environment, a third-party moderator, and discuss it. Maybe when it's done, we will all agree that we see things pretty much the same as council...Maybe not...either way...there will be dialogue and I think that's the most important thing.